Peterborough Athletic Club’s rising star Lewis Davey won an East Anglian title at the weekend. The talented 17 year-old all-rounder won the senior boys decathlon when representing Lincolnshire at the East Anglian Schools Combined Events Championships in Boston. Rosie Jacobs (left) and Emily Maltby in hurdles action. And he grabbed the gold in style, registering a magnificent seven personal bests along the way. They came in the 100m (11.1), long jump (6.74m), shot (10.10m), 110m hurdles (15.7), discus (27.00m), javelin (36.00m) and 1500m (4.28). In the other events he cleared 1.76m and 3m in the high jump and pole vault respectively, and ran 49.2 in the 400m to finish first with 6,131 points. Davey is listed in the top 10 in the UK Under 20 400m rankings. 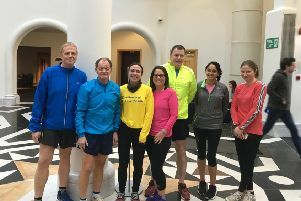 There was further good news to emerge from the PAC camp at the weekend when the England team was announced for the Home Nations Masters Marathon event. Kirk Brawn has been included in the Over 40 team which will compete in Chester against a Celtic Nations team on October 7. PAC man Brawn earned his place when clocking 2.42.54 in the Manchester Marathon. Peterborough athlete Daniel Mees was a winner at a big meeting in Loughborough at the weekend. The city-based 800m runner was in action at the British Milers’ Club Grand Prix and won the 800m B race. There were high quality fields throughout the races, including New Zealand’s double Olympic 1500m medallist Nick Willis contesting the A 800m race, but windy conditions slowed many of the winning times. Despite this former PAC man Mees, who runs for Newham & Essex Beagles and trains with the PAC distance running squad, lowered his personal best to 1:51.82, a performance less than two-and-a-half seconds outside the winning time for the A race. His run saw him moving into position to strike through the last lap, before accelerating to the front in the final 100m and holding off the rest of the field to take the win. Long-striding Latvian Edgars Sumskis set a new Southern League 2,000m steeplechase record at Bromley on Saturday, writes Barry Warne. The Latvian international completed five laps of the track in 5:47.06, finishing almost 200m clear of the runner-up. Even for a Division One fixture standards were particularly high, but having won the league in two out of the last three seasons Nene Valley have become the team to beat. Despite finishing fourth there were some outstanding performances from athletes both young and not so young as the Nene Valley conveyor belt continues to produce a steady flow of talented youngsters. Teenage sprinter Ronan Rawlings took on a strong 200m field and won in a new PB of 22.13. The in-form youngster took the 100m runners-up spot in a season’s best 10.89. Emily Maltby achieved second place in the 100m hurdles with a time of 17:38, and Rosie Jacobs won the B race, and was just half a second slower than her team-mate. Maltby was clearly Nene Valley’s athlete of the meeting and won the long jump with a leap of 5.03m and the triple jump with a distance of 11.17m. The 23 year-old finished second in the B high jump and third in the 100m. Youngster Jasmine Allen won the B long jump ahead of Southampton AC athlete Jasmyn Allen. The Nene Valley athlete was second in the B 100m. Martin Tinkler suffered a rare defeat in the shot, finishing second despite a 14.42m throw. Simon Achurch took second place in the B event. However, normal service was resumed as the pair won the A and B discus with Tinkler gaining a new PB of 43.81m. Achurch also won the B javelin. The ladies maintained their usual good form in the throws, and Becki Hall won the shot with a 12.67m throw. Lydia Church won the B event with a new PB of 10.76m. Veteran Andrea Jenkins threw a season’s best 39:62m to win the discus and Hall added to her points tally with second place in the B event. There was also a pair of second places in the hammer with Jenkins and Kelly Lawrence taking the honours. With the Nene Valley team a little depleted for this meeting, team captain David Bush led by example competing in six events, and claimed runners-up position in the javelin and B long jump. Maltby and Jacobs also both took part in half a dozen events.